The UCSF Fresno Department of Emergency Medicine is raising funds for its first endowed chair, which honors the life work of Dr. Gene Kallsen. 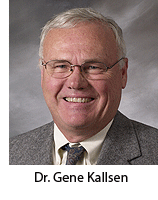 Dr. Kallsen is highly respected for his contributions to emergency medicine and EMS. He has dedicated nearly 40 years to UCSF Fresno – as one of our earliest residents, then joining the faculty, later becoming Chair. The Gene. W. Kallsen, MD, Endowed Chair in Emergency Medicine will support excellence in education and leadership at UCSF Fresno by permanently endowing the position and providing a stable source of funding to continue attracting highly skilled, talented and innovative emergency physicians and educators. Thanks to lead donor (Community Regional Medical Center) and other key donors (Central California Faculty Medical Group, American Ambulance, Department of Emergency Medicine), we have already raised over $824,247 toward our goal of $1 million. To make a donation, please click here and select Gene W. Kallsen in the second section. So far, $824,247 has been raised toward our goal of $1,000,000. Click here to donate and help us meet our goal!